I downloaded the latest Media Player Classic HomeCinema in this site. I downloaded X86, With installer. svn 1280 is ok, but svn 1281, 1285, 1290 detected by SONAR, and then quarantine them. I think it's a false-detect, can you check? Re: NIS 2010 SONAR always detected Media Player Classic HomeCinema and quarantine it. It seems if I use submit page send to Symantec Security Response , it can't fix false-detect. Because only SONAR detect it, not the virus scan. And another reason, the Media Player Classic HomeCinema version changes several times a week, I can't send all of the files. I think maybe they can always review the page and the latest version if they can. We are currently looking into this issue and will contact your privately for more information and with a resolution. Let me make sure I understand you correctly.... Are you seeing a prompt like this one? This is what I'm seeing when installing the program you describe. This is in fact a detection by SONAR 2. However, it is not a conclusive one so we do not automatically take action. Instead, we display this prompt to the user so he/she can make the decision. To help, we supply a recommendation based on a combination of all our technologies - heuristic engine, the Norton Community prevalence information at the bottom of the window, static scanning, etc. I've gone ahead and have added this website to our queue for site monitoring so that http://www.xvidvideo.ru is regularly monitored (might take a few days for data to be available to end users). I've also started to track this FP on our side so that we can improve SONAR. -ONE- has chosen the mode -> Sonar advanced Mode to Aggressive. and remove automatically. SONAR detects high-certainty threats and even the low-certainty threats with few suspicious characteristics. 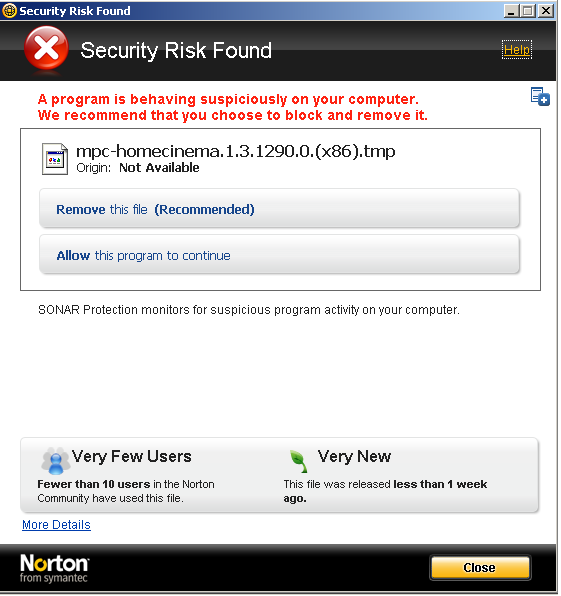 SONAR removes all the high-certainty threats and notifies you about all low-certainty threats. This setting is highly sensitive and might cause the legitimate files to be identified as threats. It is recommended for advanced users only." Yes, but I can't finish installed MPC-HC. I think maybe that's because my setting(I like to automaticlly remove. ), so SONAR not asked me run it or not. And another problem, I had clicked "Trust Now" of Norton Insight, let the file become "user Trusted", but SONAR still work and quarantine it. We can also provide mitigation from false detections via Quorum - so please don't hesitate to let us know of any issues you have uncovered. We have the mechanisms to prevent other customers from facing the same issues. I want to suggest maybe you can let Symantec Submit and Threat Expert samples also send to Quorum Network. I think maybe it's can increase much samples to make Quorum Network more better.